Simms has announced a new vice president of global sales for the company: industry veteran Steve Bendzak. “We couldn’t be more thrilled! After an exhaustive search, we’ve found the best fit for Simms and we’re excited to have Steve join Simms to manage our Sales & Service teams,” says K.C. Walsh, Simms President. BOZEMAN, Mont. (Nov 17, 2013) – Simms continues to strengthen its management team based in Bozeman with the announcement of Steve Bendzak as Vice President of Global Sales. 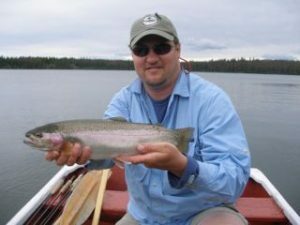 Steve’s experience in the fishing industry and outdoor specialty includes 22 years at brand stalwart ExOfficio, where he managed the sales department as Vice President of Sales and, ultimately, General Manager of ExOfficio for their parent company, Jarden Corp. Steve oversaw accelerated growth with the brand over that time period. As VP of Sales, Bendzak will oversee Simms’ external Sales Representatives and international partners as well as the in-house sales team. In addition, he will manage the Customer Service department for retailers, pros and consumers, the Customer Care Center and E-commerce division. Steve will be relocating with his family to Bozeman, MT during the remainder of 2013 and will start his new role with the company beginning Jan. 2. “Fishing has been my true passion since growing up guiding and spending summers at our family lodge in B.C. To join the Simms culture, where fishing is the lifestyle and product quality sets the gold standard, is a dream come true. This is a great company and brand and I can’t wait to get started,” says Steve.